Posted on November 2, 2017 | Comments Off on Save the Date! We had a wonderful gathering of historians Saturday (Mar 18) at the Floyd Norgaard Cultural Center in Stanwood in spite of the driving rain. Representatives from all of our Heritage organizations met to share ideas and learn more about each other projects. Once again this year the projects were amazing efforts of research and interpretation and all worthy of recognition. 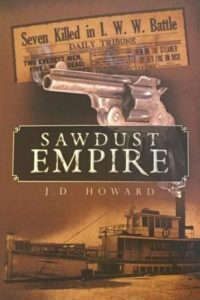 Historical novel featuring the mystery and various perspectives on the 1916 Everett Massacre and shingle weavers union strike. It also tells the story of the timber industry of the day and life in Snohomish County at the time. 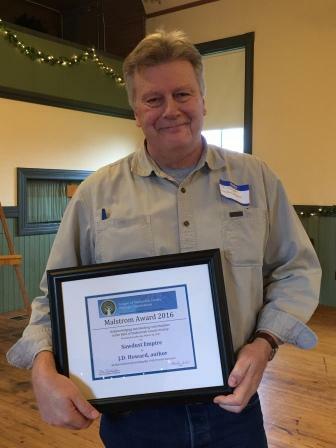 Join us for the 2016 Heritage Awards at our special potluck luncheon on Saturday, March 18. Mark your calendar and plan on attending. Nominations for 2016 are listed here. 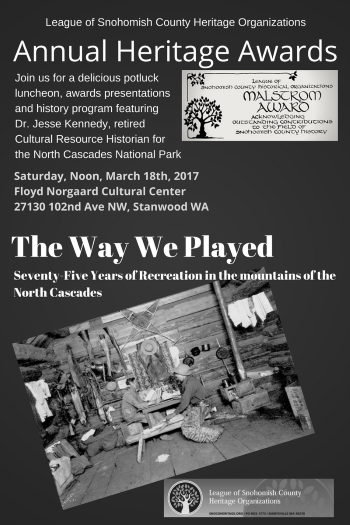 This year’s program features Dr. Jesse Kennedy, retired Cultural Resource Historian for the North Cascades National Park. There is no cost, except for bringing a potluck side dish/dessert to share with others. The LOSCHO Board will bring a variety of main dishes and provide water, coffee, and tea.